Nerdoh have just released this great new Tee, based on Nick Frosts character in Shaun of the Dead!! 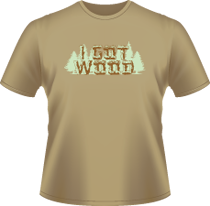 So we have the 'I Got Wood' slogan in the same colours on the same colour tee! Looks great and (zombie permitting) will last and last throughout civilisation’s decay. Super premium cotton khaki t-shirt with a pale green and tan print. Inspired by Ghostbusters, Nerdoh has produced this ultimate tribute t-shirt. A Khaki (overall coloured) premium t-shirt, printed with a subtle Authorised User/Proton Pack as a left breast distressed black design. 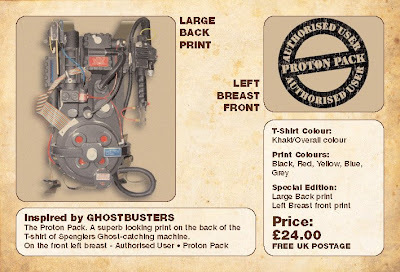 And on the back a large SUPERB image of the Proton Pack itself in lovely detail. Looks great and, in the spirit :) of Nerdoh, a little different from your average Ghostbusters inspired t-shirt. This Special Edition design is £24. FREE UK postage, LOW WORLDWIDE.